EURUSD is under the influence of some economic reports such as French 10-y Bond Auction, Trade Balance, and French Final CPI m/m in Eurozone and Natural Gas Storage, NAHB Housing Market Index, Import Prices m/m and Unemployment Claims in the US. 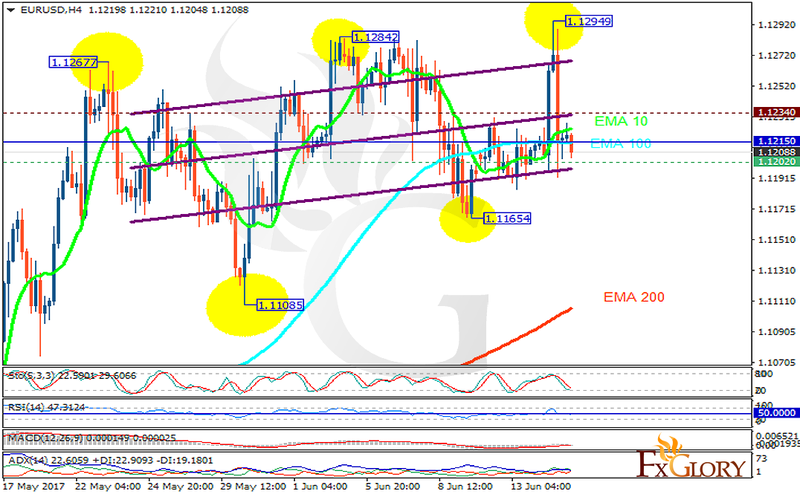 The support rests at 1.12020 with resistance at 1.12340 which the weekly pivot point at 1.12150 is located in between the lines. The EMA of 10 is moving with bullish bias along the ascendant channel and it is above the EMA of 200 and below the EMA of 100. The RSI is moving horizontally on the 50 level, the Stochastic is showing downward momentum and the MACD indicator is in neutral territory. The ADX is not showing any clear signals. EURUSD seems to be volatile today; the 1.13 level seems to be too strong to be broken therefore short positions are recommended for short term traders targeting 1.11.